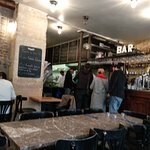 Le Daily Syrien is another great restaurant on the already famous on our blog rue des Petites Ecuries in the 10th arrondissement. 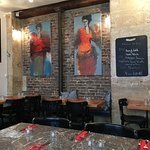 It is Syrian cuisine restaurant and a quite upscale one. The food of great quality, beautiful design and lovely staff. 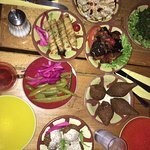 The menu has hummus, falafel, different mezes, shawarma and selections of grilled meat. For the first visit, we decided to opt for featured here Vegetarian Plate - it was very very good. 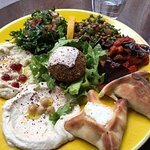 Two different hummus, one bowl of falafel - we wanted more - taboule, baked eggplant with tomatoes, sambouseks (stuffed pastries) with cheese and spinach. All ingredients were complementing each other so well that you can quite a lot it. 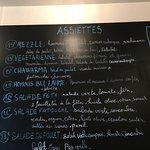 We will definitely be back to try rest of the menu. 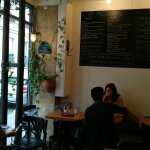 We arrived in Paris after a fast train trip from Amsterdam and got advice from our Airb'n'b host about good local restaurants and cafes. 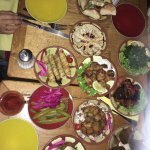 We headed off to The Syrian Daily with some confidence that we would enjoy some middle eastern food but that confidence was not matched by our experience. 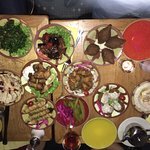 We each ordered a mezze a mdium plate of perhaps ten small dishes. She had vegetarian I had a meaty mezze. Some of the dishes were fine ... good, tasty, fresh and appealing including the usual dips but some of the dishes were tired, reheated or even cold when hey needed to be hot and sparkling. The service was fine and the small choice of wines or beer worked well enough but this was a disappointing meal. Been to The Daily Syrian? Share your experiences!